A.G. says he’ll decide what to do with donation after he finds out more from fed investigation. Steve Griffin | The Salt Lake Tribune Attorney General Sean Reyes speaks to his guests during his inaugural program in the State Capitol Rotunda in Salt Lake City, Monday, January 5, 2015. 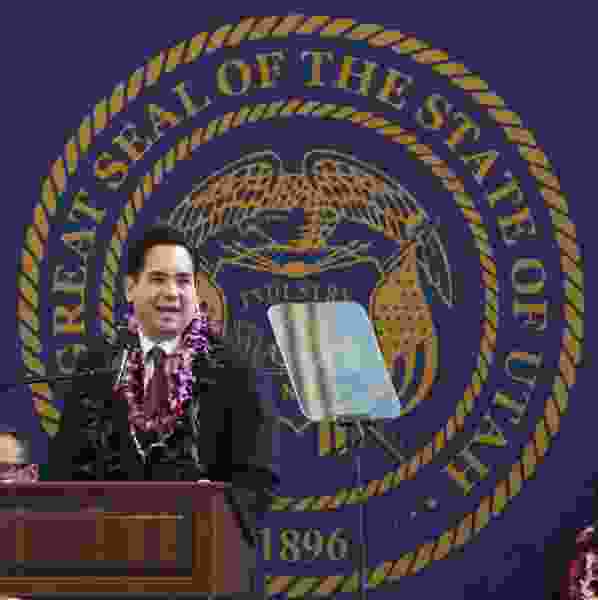 Utah Attorney General Sean Reyes plans to place in escrow $50,985 in campaign contributions from the biofuel company federal agents raided last week. "After looking at all the circumstances involved, we're going to go ahead and put the donations in escrow until we get some directions from the feds," said Alan Crooks, Reyes' campaign manager. Reyes may decide to return the money or give it to charity when he learns more about the federal investigation, Crooks said. "They're not very forthcoming with us right now," Crooks said of federal agencies who participated in the raid. The money came from Washakie Renewable Energy and its executives — Jacob Kingston, his wife, Sally, and his brother Isaiah. The brothers are sons of John Daniel Kingston, who was jailed for beating his daughter into unconsciousness in 1998 after the girl, then 16, ran away from an arranged marriage to her uncle. The Kingstons belong to a polygamous sect known as both the Latter Day Church of Christ and the Davis County Cooperative Society. Last week, the IRS and the Environmental Protection Agency raided offices in Salt Lake County belonging to Washakie and other businesses affiliated with the Kingston clan. No arrests were made, and no charges have been filed. The search warrants are sealed in federal court in Salt Lake City. Washakie and its executives have given about $190,000 to state and federal candidates and political committees since 2011, according to campaign-finance reports. Reyes has been the biggest beneficiary. Crooks has said Reyes did not know anything about Washakie's business practices. Last year, the EPA and the U.S. Department of Justice announced that Washakie agreed to pay $3 million in fines to settle allegations it did not make any biodiesel from January to October of 2010 but still claimed tax credits during that span. Reyes' election filings say his campaign ended 2015 with $256,886. Steve Griffin | The Salt Lake Tribune The Washakie Renewable Energy facility in Plymouth, Utah Friday, February 12, 2016.